26 May 2008: HRA Director Chris O’Dempsey announced this week that Van-Anh Nguyen has accepted the role of HRA Ambassador. “This is a tremendous thing for both Heart Reach and Van-Anh, and we look forward to seeing many positive activities and results from this new position. “Van-Anh is a delightful young lady, with a youthful exuberence that flows through not just her music, but her whole personality. She adds a tremendous dynamic to our ‘team’, and will, I am sure, endear herself to everyone she meets within the fulfillment of this role, just as she has endeared herself to all of us at HRA who have had the pleasure of sharing with her. Australian born (1987) Van-Anh studied at the Sydney Conservatorium of Music, starting at just four years of age. She achieved an associate diploma in piano when nine. o New South Wales state finalist in the Yamaha Piano Youth Competition in 1999, 2001, 2003, and 2005. She has also given recitals in many countries including the US, Germany, Austria, and Viet Nam. Following two successful concerts in 2008 and 2009 at Queensland’s Sunshine Coast, Van-Anh has booked to perform there again in the future. At the July ’10 concert in Ho Chi Minh City, it was announced by HRA Director Chris O’Dempsey, that singer / songwriter Thanh Bui had joined Van-Anh Nguyen as an HRA Ambassador. Thanh brings a great degree of enthusiasm, as well as talent, to this important role, and together with Van-Anh, they are committed to helping impact Vietnam for good, and assist in the programs aimed at alleviating poverty and poor education currently being undertaken by Heart Reach. Described by Michael Kieran Harvey (concert pianist and composer) as ‘a true talent…she will be a great hit wherever she goes’, Van-Anh Nguyen is a passionate 23 year old Vietnamese-Australian pianist. Born in Sydney, 1987 to Vietnamese refugee parents, Van-Anh started learning the piano at the tender and astounding age of 15 months with both of her parents (of whom are both professional musicians). By the age of 4, she was accepted into the Young Artists Program for gifted & talented musicians at the Sydney Conservatorium of Music. By the age of 9, she had obtained her Associate Diploma in Music (Australia), and at aged 12, received her Licentiate Diploma in Music (Australia), making history as one of the youngest in her generation. She has given numerous media performances including on Channel 9’s Kerry-Anne Kennerley Show and Channel 7’s The Witness Program. Since the age of 5, she has given live radio performances on 2MBS-FM and the ABC. 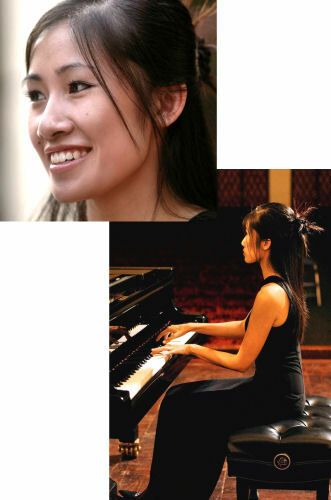 She has won several awards and prizes during her piano studies across Australia, having taken out the Kawai Piano Award (Australia) and the Audience Prize in the 13th Sommerklavierfest, Bad-Bertrich (Germany). ‘Anyone can read the music and give a perfect performance of a piece if they practice hard enough however for me, it is much more than that. I will tell a story with every piece I play, pulling at every emotion and mood created through each note in the piece’, says Van-Anh. Her bubbly personality and emotive playing has graced the stages of Sydney. Van-Anh continues to give extensive concerts around Sydney as well as along the east coast of Australia at events such as the Mostly Mozart Series, World Youth Day 2008, the Chinese Chamber Music Festival and various charity events. She has also performed overseas in such countries as Germany, Austria, USA and Taiwan. In November 2005, she made her solo debut in Vietnam with the Ho Chi Minh City Symphony Orchestra. Continuing on in 2006, 2007 and 2008, Van-Anh gave concerts once again in Ho Chi Minh City, sponsored by the Australian Embassy. Other than performing, Van-Anh’s passion extends into writing, having graduated with a Bachelor of Media (Writing) degree. She has written for ABC Limelight Magazine and continues her writing for 2MBS-FM’s Fine Music Magazine. However through her passion and love for spreading music to youths and audiences, Van-Anh dropped her second Bachelor Degree in Law to return to music and obtain her postgraduate performance degree at the Sydney Conservatorium of Music. Her goal as a pianist is to ensure that the classical genre continues to be appreciated by the younger generation of today by making it more accessible not only as a genre but also revolutionise the concert experience by creating an interaction between herself and her audience. 2011 sees Van-Anh collaborate with singers, DJs and producers to create her new crossover album, a fusion of classical pieces as well as her own compositions mixed with urban beats. Recently, Van-Anh has collaborated with pop artists Scarlett Belle, Thanh Bui and is part of electronic/pop/soul/alternative band, The Artisans. Since May 2008, she has been appointed as Ambassador of Heart Reach Australia.